One thing that really makes working in the command line in Linux a pleasure is the various in-built shortcuts and name completion features in Bash - the default shell in Linux. But one grouse I always had was it was really difficult to remember all the options that each command had. For example, 'find' came with numerous options which I found difficult to memorize and had to resort to reading the man page each time I had to use the command. 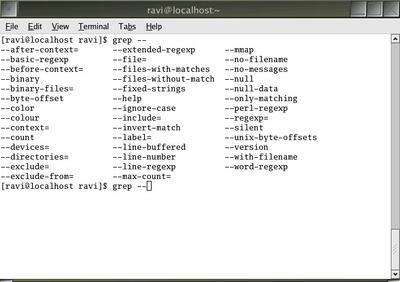 Now you can enhance the bash shell to give you the added functionality of listing the options that can be used with a command. For that you should download and install an add-on package called bash-completion. I use Fedora Core 2 but if you are using the latest Linux distribution, it might be installed by default on your machine. ... followed by two TABs and you get all the options that can be passed to the grep command (see figure). This works for any command in linux. Now you don't have to remember all those options that need be passed to the programs any longer. Great stuff, Bash completion is worth its weight in gold in my opinion. I particularly like bash completion with ant. i don't have to invoke -projecthelp to see the list of available targets anymore. I want to clarify one thing: with certain commands, if 'command' followed by 2 dashes fails, try typing only one dash. find - [2 tabs], just because all find switches are preceded by one dash.